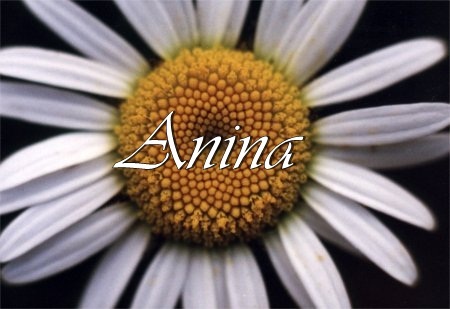 Today’s name of the day is Anina, which I stumbled upon today while looking for names that Nina could be a nickname for! I think that Anina adds a certain flare and elegance to the nickname Nina. Anina is a German diminutive of Anna, but I think it’d make a good first name too. The name Anna is a form of Channah (Hannah) used in the Greek and Latin Old Testament. Many later Old Testament translations, including the English, use the Hannah spelling. The name appears briefly in the New Testament belonging to a prophetess who recognized Jesus as the Messiah. It was a popular name in the Byzantine Empire from an early date, and in the Middle Ages it became common among Western Christians due to veneration of Saint Anna (usually known as Saint Anne in English), the name traditionally assigned to the mother of the Virgin Mary. In the English-speaking world, this form came into general use in the 18th century, joining Ann and Anne. The name was borne by several Russian royals, including an 18th-century empress of Russia. It was also the name of the main character in Leo Tolstoy’s novel ‘Anna Karenina’ (1877), a woman forced to choose between her son and her lover. 2 Responses to "Name Of The Day: Anina"
My first thought on possibly middle names was Anina Dorothy. Infact, I seem to lean towards middle names ending with an ee sound; Anina Lucy, Anina Phoebe, Anina Maisie and Anina Lily all sound delightful. I really like your idea of Anina Dorothy!